Again going to Bangalore, we used eat a lot outside and this is also one of them. Many might have seen Southekayi selling near parks and schools. Its very refreshing and hot. 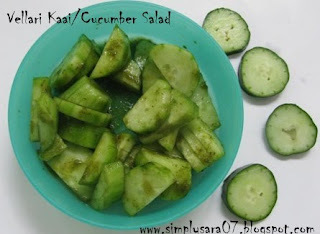 I have used Japan Cucumber where in I could not go to Little India to get the normal one. It almost tasted the same. Remove skin and cut 1 no of cucumber into cubes or small slices. Add salt and required green chutney or pudina chutney(Grind Pudina/mint leaves wtih green chilli to fine paste) and mix well. Add little lemon juice. Salad is ready. This can be had as it is or with lunch or dinner. Prefect salad for summer..love it. This is a regular at our place after dinner..Healthy.. New kind of salad... Nice space here too..
New to me.Will try it soon.